Every time you pop in to in-kyo recently there’s someone unexpected to interview. The other day it was a kitchen tools distributor, last week guitarist Hayato Aoki. You ought to tell store-owner Chie Nakagawa you’ll write about her! But today it’s these two fellows who have driven down from Fukushima to show Chie their new chairs, upholstered in locally sourced deerskin. The animals’ population has gotten out of hand and they’re being culled in the wild. For the first time the 85-year-old, Fukushima-based La Vida furniture company is using the leather in its chairs. This includes pieces by designer Dai Misaki (on Chie’s right), assisted by Daisuke Hasegawa (left). Other chairs include reupholstered vintage Stacking Stools – the iconic Showa-era design by Isamu Kenmochi. 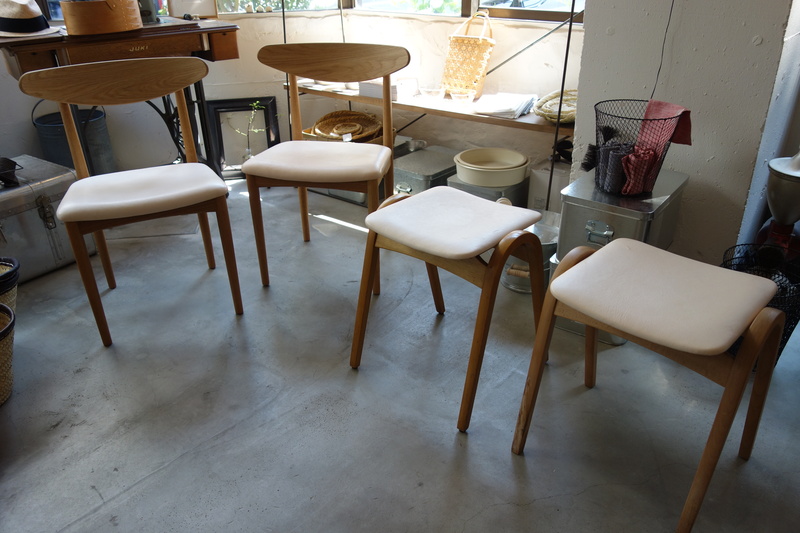 Sitting on the chairs you notice the softness of the leather, which is not coloured but a little bleached, says Misaki. It has a pinkish tinge. The seat is low – it’s a common height for Japanese furniture, says Hasegawa. But maybe it’s good for a kids room too. After a little more sitting the chairs are packed into the van as the boys are going to show them at the launch of a book about the deer-hunters of the Japanese forests.